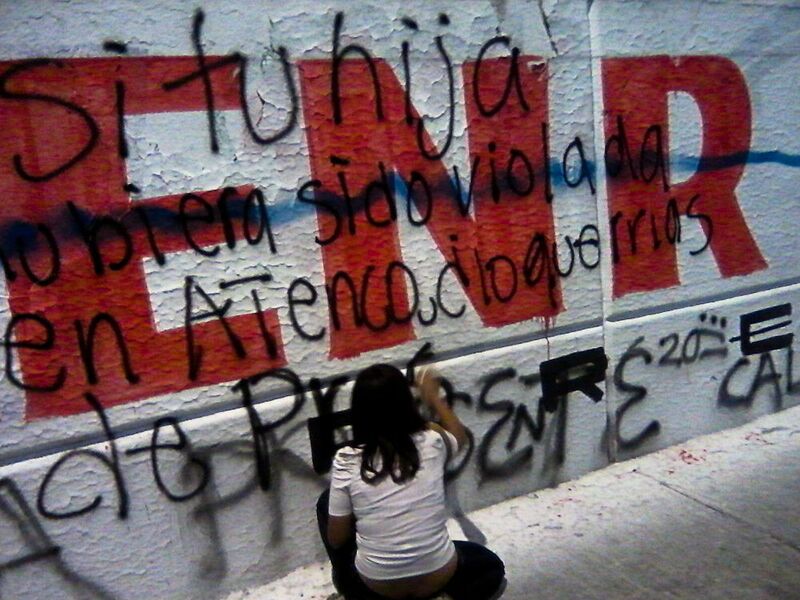 In Mexico, December 1, 2012, will be remembered as the day that an imposition was legitimized. Enrique Peña Nieto — his name is often abbreviated in Mexico as “EPN” — took the reins of power in the context of deep indignation and amidst heavy state crackdown against crowds of protesters. A number of actions were planned in Mexico City to show the illegitimacy of Peña Nieto’s presidency, particularly given the unfair media attention he received and the electoral fraud that took place to ensure his victory. On that day, Mexico’s historic center and the congressional buildings were a microcosm of the Mexican state as a whole. The Legislative Palace of San Lázaro, which houses Mexico’s Congress, appeared to be a giant fortress, deaf to the rubber bullets and tear gas grenades that the federal police fired at protesters. Nearby, the presidential palace stood on one side of the Zócalo, the main square of Mexico City. Across the street from the palace, Alameda central park had been turned into a battleground between protesters and police. The violence forced the “embroiderers for peace” — a group of artists who had gathered to display embroidered handkerchiefs that symbolized those killed or disappeared during former president Calderón’s six-year drug war — to withdraw from their peaceful protest. As EPN lifted his right hand and promised to protect the Constitution, the story of a Mexico without a president began. The inauguration was marked by discontent and indignation in the streets, juxtaposed against the sense of denial — “nothing to see here” — taking place in a presidential palace living in a media bubble. “I will govern looking out for the well-being and prosperity of the union, and if I don’t accomplish it, may the nation demand it of me,” Peña Nieto declared in his inauguration speech. This speech and the government-controlled narrative of the day’s event have been widely broadcast. But the story of the day’s protests tended to be suppressed and distorted by official propaganda. 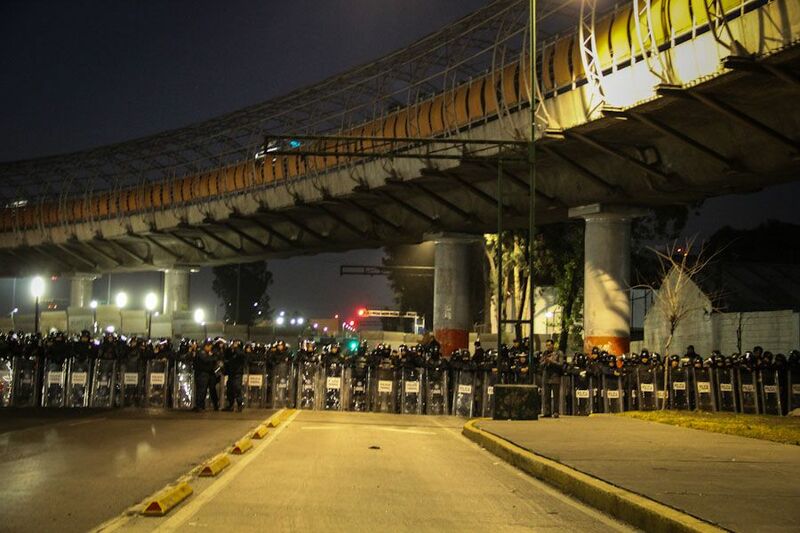 The protests against Peña Nieto’s inauguration began early on December 1. At 3:15 a.m., more than 100 people gathered below the Monument to the Revolution in Mexico City. They came from different groups, and one could tell that many of them didn’t know one another. On the ground lay a giant sign that read, “Peña Nieto is not my president.” Most of the protesters came with their faces covered and carrying recycled objects to be used for self-defense. Just before 5 a.m., the crowd had grown to 300 people and the march began. They walked along Buenavista Street, until reaching Thoroughfare 1 North. Their destination was San Lázaro, the official headquarters of Mexico’s Chamber of Deputies and the place where Enrique Peña Nieto would make his first speech as president. The area had been closed off since the previous week, with medieval-looking fences and a massive police force. Members of the Yo Soy 132 student movement that took the streets over the summer were not visible — at least not among the un-covered faces. The group had issued a public call on their official website to make a “human wall” around the San Lázaro Palace on the day of inauguration, an action they’d called “Operación #1Dmx #OcupaSanLázaro.” Yet, at the pre-dawn urban guerrilla march there were very few creative posters or joyful and unified songs; Yo Soy 132’s usual energy was nowhere to be found. As the crowd marched someone cried, “Get rid of them all!” A poster signed by the Mexican National Education Workers’ Union declared: “Today we move from resistance to offensive.” The group passed by the neighborhood of Tepito, receiving disconcerted looks from the workers, who at 5 a.m. on that Saturday were out, drinking an atole before starting their work days. “Tepito, listen, this is your struggle too,” proclaimed a few marchers. 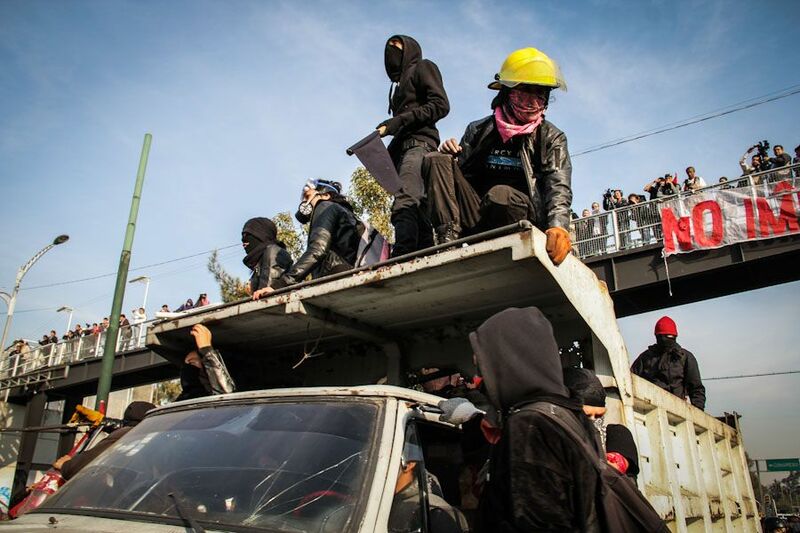 Little is known about the Frente Oriente Pachuca, nor about the Ejercito Popular Magonista de Liberación Nacional, a new armed revolutionary group that published its first communique on November 30, one day before the call to Occupy San Lázaro. The sun had barely risen when protesters broke the first security fence down. The battle began: tear gas, rubber bullets and serious injuries. Molotov cocktails flew, and furniture became barricade construction. Neither journalists nor protesters were fully prepared for the repression. Few people knew how to deal with the effects of tear gas, especially not the workers and pedestrians leaving the San Lázaro Metro station. Suddenly, a trash truck carrying 15 passengers arrived that crashed into the security wall amidst euphoric cries. Meanwhile, a large number of teachers from Section 22 in Oaxaca and other states of México remained outside of the San Lázaro area, waiting to march. At 10:35 a.m. a “tactical withdrawal” was announced. Protesters issued military-sounding orders, amplified by the only microphone available. The teachers from Section 22 left San Lázaro and marched toward the center of the city. At 1:09 p.m. Peña Nieto finished his speech at the National Palace, while someone wrote “Revolution flows in our hearts” on the ground at the entrance of the Palacio de Bellas Artes. The imposition had been legitimized and EPN announced his 13 goals and five core ideas. The first: “a Mexico with peace and justice,” a vision that contrasted strongly with the repressive violence outside. The chronicle of a Mexico without a president didn’t end after 20 hours. December 1 was only the first paragraph in a larger story of struggle against an imposition that has only begun.